One of the biggest benefits of skylights is that they allow more natural light into your home. Not only can this help reduce the need for artificial lighting during the day, but it can also add a sense of warmth and positivity to a room and potentially provide a mood boost as well. Skylights can help you create a more relaxing environment inside your home with natural light while also improving aesthetics and increasing the value of it. Skylights are also a great way to have more windows while maintaining some privacy. Many homes are built closer together, so windows in a wall can sometimes make you feel exposed. Skylights give you the light of a window while adding a sense of privacy. This makes them a great option for more private rooms, like a bathroom or bedroom. You can get natural light into these rooms with skylights without neighbors or passerby being able to look through them. Skylights can also increase the energy efficiency of your home. Because they allow natural light in, you often don’t need to turn on as many artificial lights during the day. This can help reduce your overall energy use. In the winter, it can also add some extra warmth to a room. Blinds can be added to further increase energy efficiency. You can close the blinds on hot summer days to reduce heat gain and on cold winter nights to add some extra insulation against the cold. Skylights are also customizable. You can add blinds to help improve energy efficiency and control light with either light filtering blinds or blackout blinds. 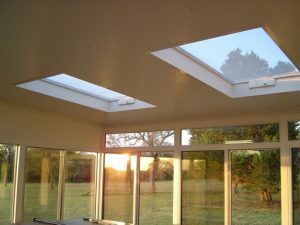 You can also opt for a manual or electric venting skylight that will allow you to open them for added air flow. There is also a rain sensor on the electric venting skylight that will close it automatically in case of inclement weather. Skylights can certainly enhance your home, especially if a little more natural light is just what you need. Contact Zephyr Thomas at 717-399-4708 to learn more about installing skylights in your home!